Black Tie and A.Maze (and Czech & Speake's Dark Rose and By Kilian's Rose Oud and Juliette Has A Gun Midnight Oud and countless others) take off down the oud path, some more so than others. Pink Quartz goes for a paler wood and incense; after the spicy-rich opening, it takes on a more delicate, airy character, and the rose fades from jammy to dewy and fresh — something closer to rosewater. The incense, which has been hanging around from the beginning, now comes more into focus, and this pale rose-y incense is what lasts for the duration. It's a lovely fragrance, probably unisex (if you're a man and you'd wear any of the other rose + saffron scents I've named, you'd probably wear this one). It did not move me to buy, but it's worth sampling, and if you're an incense fan and you haven't tried the others in the Olivier Durbano line, you might as well get a set. My favorite, and the first one I'd snap up if the line ever found its way to the bargain bin at TJ Maxx (yeah, not likely): Black Tourmaline (with Pink Quartz coming in second). If you have a favorite from the line, do comment. Olivier Durbano Pink Quartz / Quartz Rose is available in 100 ml Eau de Parfum; for buying information see the listing for Olivier Durbano under Perfume Houses. Even more rose + saffron: Odori Zafferano, Ormonde Jayne Ta'if, Agent Provocateur. There's also Amouage Tribute, which I have not smelled, and several of the Montales + a few from Les Parfums de Rosine. 1. The fragrance is called Pink Quartz in the English press materials and Quartz Rose in the French. Confusingly enough, I think most English speakers refer to this stone as "Rose Quartz", but at least one source says that "Rose Quartz" and "Pink Quartz" are two different stones. 2. From the press materials, in case anyone wants to know more about the stone: "A fundamental stone of universal love and of infinite compassion, compassion towards oneself and towards the Other. 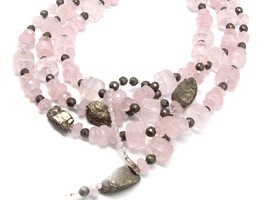 The Pink Quartz is linked to heart "chakra". It opens on dreams, it is inspiring, leading to the source of inner peace, of absolute calm and happiness. From the stone to the flower, a love ritual of healing, a sacred procession, a conversion ceremony leading to such essential qualities as purity, spirituality and compassion. The rose, whether considered among minerals or taken in the flora, remains a powerful symbol at the crossroads of our human emotions." Oh geez. Another house not on my radar! How can we possibly keep up? I am getting overwhelmed! Ha ha. There are SO many incredible scents out there. So many. And the more I delve into high quality fragrances, the more I find that I love. Oh woe. Not really. It’s so amazing to smell all these wonderful fragrances, isn’t it???? Good point – thanks, Robin! Oh this sounds nice. Incense that arrives and stays-wonderful. Rose-y incense- mmm! How prevalent is the white musk? I don’t seem to get a good reaction to it. There is enough “dirty” from the incense and resins that it doesn’t smell like laundry detergent. God, I love that necklace too! I own a bottle of Rock Crystal and am very fond of it. It smells like cedar planks over a hot fire. Ooh! Really?? That’s pretty enticing. I could fix you up a sample as I believe we both live in PDX. Yes, we do! Just send me a message at MUA, if you’re on there. I’m under the same name there. That one is really cool — it’s almost *too* dry for me, which is hard to pull off. Love rose quartz (the gemstone). Love roses too, especially spicy, musky ones. Might need to try this – I haven’t tried any in this line yet. We can find these scents where…? They have some at Luckyscent, although they don’t seem to have this one. I assume they’ll get this one, and so will First in Fragrance. Thanks for all the references to other rose and saffron scents! I have only sampled L’Artisan Safran Troublant and was interested in finding other perfumes that explored those notes more deeply – intensely? Anyway, I was looking for more oomph! Have fun — it’s quite a list! That was my beef with ST as well – I liked it, but I wanted more, you know, oomph. I felt that way too, the first few times—it felt thin. But then out of nowhere, I’m totally enamoured. I wonder if our noses change like our tastebuds?? Because I am shallow, I have not been interested in this line because I don’t like the bottles. I think they look cheap. But (also because I am shallow) I have a love of gemstones that goes back to childhood, and rose quartz (or pink quartz– whatever) is calling my name. I may have to get over my aversion to the bottles and try some of these. Oh… wait. I did try Turquoise and hated it. Never mind. Interest in a beautiful bottle is not shallow. Glass is an amazing substance, derived originally from melted sand. Glass technologies have been a state secret as late as the 1970’s when bead factories in Eastern Europe were protected with machine guns. The use of standard, and then lovely bottles, to package scents was one of the key steps in the development of perfume from local chemists to an industry. I regard the bottles as min glass sculptures. A bottle doesn’t have to be “fancy” but, it shouldn’t be ugly. For example, I love Commes Des Garcon’s flask shape, which has a utilitarian look and feel. An ill proportioned or overly designed bottle would never tempt me to open it. Try going to Murano and telling them you’re a glassblower — all of a sudden they start treating you like Mata Hari (and not in a good way!). I’m with you, Dilana – glass is a beautiful material, and a good bottle really adds to the enjoyment of perfume. My new J’Adore L’Absolu arrived today and I was just admiring that lovely bottle – very fitting for the lovely scent. I also love lampworked beads (stringing them, not making them myself), though I’ve gotten away from that hobby as I pursued perfume in earnest. I only tried Turquoise, which I didn’t like because of the marine note, so I gave it away. Of course, I have looked for it since and will probably need another sample, because it stuck in my mind and I know sometimes perfumes do that for a reason. I will wait for this to be at LS and get a few others from the line. Black Tourmaline has always intrigued me. I hate that! And then sometimes you get ANOTHER sample and still, nothing, and years later you’re still chasing down the xth sample…oh, that’s me, not you! No, it has been me, too. I didn’t like Turquoise either, and I like marine notes! This one sounds really nice, though. See? I kind of liked it *despite* the marine note, which is why I want to try it again! I would have thought you would have liked it. I know! I certainly wanted to like it. And see, I really sort of liked Turquoise, though I only had half a passed-along sample to work with. I’d almost like a decant to get a better impression… but who can keep up when one is constantly performing triage?? Next to Rock Crystal, I liked Black Tourmaline. Amethyst was only OK, and Turquoise was reminiscent of turpentine. I don’t think I have tried Jade. Jade was interesting, I keep meaning to try it again. When I first read about this over at Sorcery of Scent (about a month ago? ), I was immediated interested. I don’t like the stone, the bottle, or the color of the juice, but, my goodness, it *sounds* divine! Robin, your review–even though you’re not tempted to buy it–has pushed me squarely into lemming territory! Funny how the same basic accord can produce so many variations. C&S Dark Rose smells mostly of rose to me. with the other notes merely adding support. OJ Ta’if is a very spicy rose, with more spice than rose in the balance, and Tribute just smells like an ashtray to me. Make that a cold ashtray with about a week’s worth of cigarette butts in it. I’m actually relieved that I don’t love it, considering the price. Pink Quartz actually does sound nice, but I think I have enough samples and lines to work my way through already. Ack, sounds like I need Tribute! Do you want me to send you my sample? That’s nice — could we do a swap? Email me at robin at nstperfume dot com. Ashtray full of butts screams “NEED” to you??? Hahahahaha (laughing to avoid throwing up… but I haven’t tried Tribute and after hearing that a few times, I don’t care to). LOL…that does sound ridiculous, doesn’t it? But I like many smoky fragrances that I’ve heard other people describe that way. You underestimate us… we love those tangents! so I’m starting to see! And I like what I see very much! Considering how much I love Black Tourmaline — definitely in my all-time top 10 — it’s odd that I’ve never tried any other Durbanos. BT is mega-butch and yet it smells fantastic on me, if I do say so myself. I’m curious as to how this one compares with Tauer’s Incense Rose — I like my roses dry, and Safran Troublant was much too sweet for me. Although I’ve also fallen victim to the general perfume malaise that seems to be catching around here, a dry incense-y rose might just awaken the slumbering perfumista in me! but seriously, this is drier than Safran Troublant, but not as dry as the Tauer. Thanks — sample binge narrowly averted! I met with Olivier in his Paris atelier about a month ago. His jewelry is truly astounding. I enjoyed testing out his perfumes because he’s clearly someone who makes perfumes for the joy of it. Robin, is there a way to get email notifications when someone replies to your comment, or do you just have to keep checking back on the thread? I am so sorry to tell you that no, there are no email notifications. There are various WordPress addons that let a blog send email notifications, but at the moment they all have drawbacks. If you do use a blog reader/RSS reader, what you can do is subscribe to the comments for the one article you are interested in, but of course then you have to see all the comments for that article so it’s not perfect.